If you’ve been following Halo developer Bungie’s new game, Destiny, on Twitter, you will have seen a good amount of new game materials, tidbits about the classes, and some neat artwork and screenshots. The newest entry is something to really pay attention to. 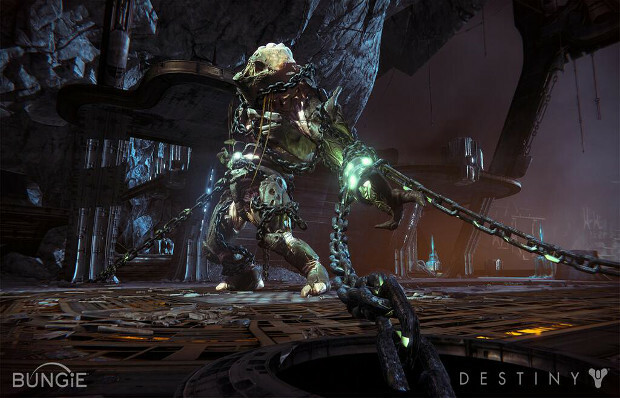 Playing on that memorable line from Jaws, the Destiny account tweeted a freaky-looking new foe accompanied by the line, “We’re going to need more ammo…” This guy is strong and deadly enough that he apparently needs to be chained to the ground so that his grotesque-looking claws and gnarly jaws can’t take apart its captors. No doubt, it will prove a hefty challenge for the heroes. Destiny is an RPG FPS with elements of prodecural generation and MMO gaming. The ambitious title, developed by Bungie and published by Activision, is slated for a 2014 release on Sony and Microsoft consoles. Tell us what you think of the monster design in the comments or find us in Facebook and Twitter!